The long reach excavators are some of the most commonly used digging machines. They are generally used for tough and complex digging and demolition works. Although wrecking balls and explosives are usually used for demolition, the long reach excavators offer a better control and more accuracy. The versatility of the long reach excavators cannot be compared with any other demolition method, as these machines can be equipped with a variety of attachments for performing different operations in the same time. There are long reach excavator attachments for scooping, hammering, pinching, picking, crushing, cutting, carrying and other heavy-duty tasks. As result, the long reach excavator eliminates the need of using separate machines for different tasks. Capable of extending its boom at incredible heights and bringing down huge buildings, the long reach excavator is a multi-functional machine that can do many things without any limits. Beside demolition, the long reach excavator is a very important machine for many industry sectors where complex digging tasks need to be carried out. However, bringing down enormous buildings by using its long heavy-duty arm is the most suitable application for the long reach excavator. Unlike other demolition machines, the long reach excavator can be operated from a safe distance to protect the operators from unexpected events. 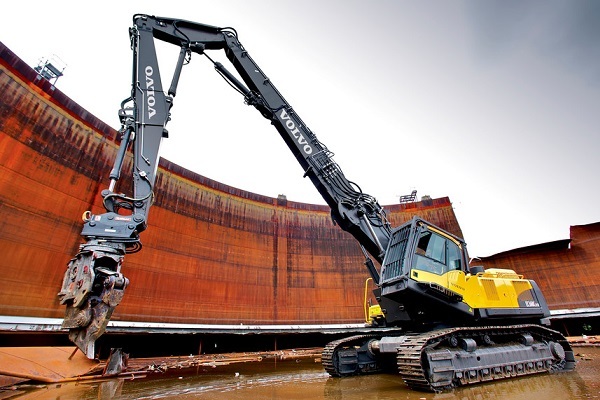 Increased Accuracy: While the wrecking ball is very difficult to control, operators can easily control the movements of the long reach excavators. The “aim & swing” technique of the wrecking ball is indeed highly efficient, but the long reach excavator can do the same thing even more efficiently and with increased accuracy. Fuel Efficiency: Easy to control and more accurate, the long reach excavator is a fuel-efficient machine because it has no exhaust gas re-circulation. The operators of the long reach excavators can expect reduced fuel consumption of up to 25%. Increased Safety: Since the arm of the long reach excavators is longer than the arm of any other demolition machine, the operators can work from a safe and far distance from the demolition project. Also, the operators have a better control over where the debris will fall. Therefore, the long reach excavators guarantee safety not only for the operators, but also for all other workers involved on the construction or demolition site. Over the recent years, the long reach excavator has been significantly improved to keep the operators comfortable and highly productive. For example, the newer models feature larger and more spacious cabins with improved visibility and automatic air conditioning system. All modifications and improvements help operators to complete their tasks more efficiently and with ease.